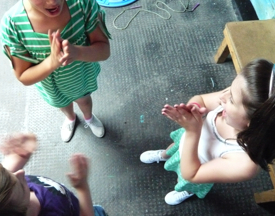 Children’s Playground Games and Songs in the new Media Age | D.A.R.E. This project ran from from March 2009 to April 2011. It was one of six large projects under the AHRC’s Beyond Text programme. Its primary aim was to update, analyse and re-present the Opie Collection of Children’s Games and Songs at the British Library. The purpose was to preserve this important aspect of our national culture; but also to explore how it continues to be a part of the lives of children living in the age of computer games and the internet. What does this oral tradition borrow from the media; and how might it connect with the entertainment and information technologies of the age of new media? The proje ct worked in three ways. Firstly, it digitised material from the collection as a new digital archive at the British Library. The listing and written commentary is now available to researchers through the BL’s online catalogue. The archive is now available to researchers worldwide as streamed audio and as downloadable files. We have also designed an interactive website available to educators, researchers, children, parents, and the wider public. The website breaks new ground in the exhibition of children’s culture, having involved children from our partner primary schools in its design and curation. 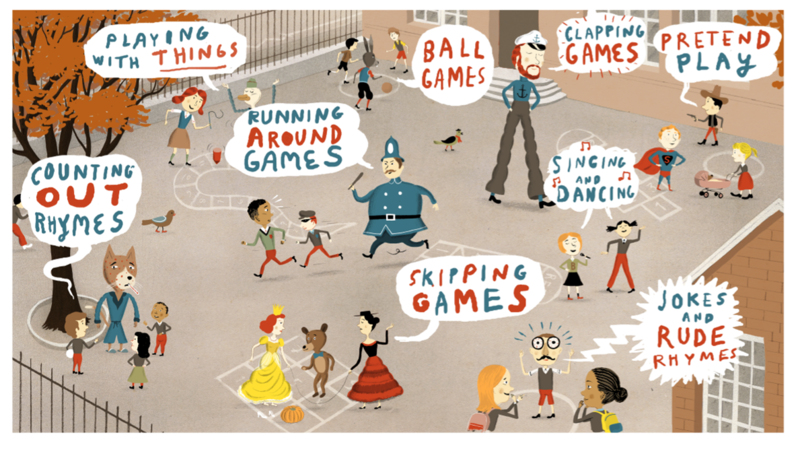 It is entitled ‘Playtimes: 100 years of children’s playground games and rhymes’, and can be accessed at www.bl.uk/playtimes. Secondly, we have carried out a two-year ethnographic study of playground culture in two primary schools, one in London, one in Sheffield. This has explored how these games, songs and rhymes are used by children today as part of a living tradition; and, again, how they relate to children’s experiences of popular media such as comics, TV, film, and computer games. Material from this study will also appear on the website, and be stored in a research archive at the British Library. Thirdly, we considered how traditional games like this are making their way into forms of new media. 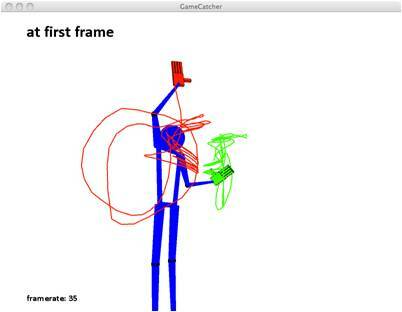 We explored this by developing an application – the Game-Catcher – for physical interactions platforms such as the Nintendo Wii and Microsoft Kinect. This has involved an innovative adaptation of the new generation of physical games, to capture playground games and make them playable as computer games, without losing their traditional character. This innovation is informed by ideas from panels of children from the two partner primary schools in the project. Finally, the project has produced a documentary film of the forms of play observed during the project, produced by Grethe Mitchell under the provisional title Ipi-Dipi-Dation: My Generation. This was screened during the final conference of the project at the British Library. The project was directed by researchers expert in children’s literacies and media cultures, and in game theory and game design, at the Centre for the Study of Children, Youth and Media at the Institute of Education, University of London (Andrew Burn; Rebekah Willett; Chris Richards); the Centre for the Study of Childhood and Youth at the University of Sheffield (Jackie Marsh, Julia Bishop); and the School of Social Sciences, Media and Cultural Studies at the University of East London (Grethe Mitchell, Andy Clarke). The project was based in the London Knowledge Lab, a research institution shared by the Institute of Education and Birkbeck College. The team at the British Library, who conducted the digitisation, cataloguing and annotation of the Opie collection, and led the website development, was Jonnie Robinson, Laura Jopson and Anna Lobbenberg. Willett, R, Bishop, J, Jackie Marsh, M, Richards, R & Burn, A (2013) Children, Media And Playground Cultures: Ethnographic studies of school playtimes. Basingstoke: Palgrave Macmillan. Pre-order from Amazon. Finally, the project has been supported by an authoritative expert advisory panel of academics, game industry representatives and specialists in children’s oral culture. We are delighted that the former Children’s Laureate, Michael Rosen, has served as a member of the panel. Michael has also contributed to the content of the website. The end of project report, which summarises the work, outcomes and key themes, and lists publications, is now downloadable from the Beyond Text website, under the Research & Workshops section, or at http://tinyurl.com/6d9zcgz.